The Ring-billed Gull is a medium sized, white-headed, primarily inland nesting North American gull that frequents garbage dumps, parking lots, and southern coastal beaches in large numbers during the winter. It is Tennessee's most common wintering gull arriving in late September and departing by early May. This species was nearly decimated by human persecution and development from 1850 to 1920, but has since rebounded and the current population is in the millions of birds. The breeding range extends from British Columbia eastward to Newfoundland, through the northern Great Plains and around the Great Lakes. Ring-billed Gulls spend the winter on the coasts from British Columbia and Maine to Mexico, around the Great Lakes, and inland across the southern United States where open water and food are available. 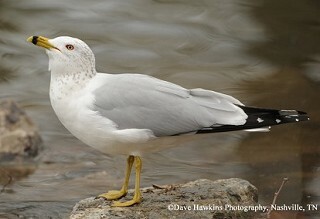 Description: Like many gulls, it takes 3 years for a Ring-billed Gull to reach adult plumage. In adults the head, tail, and underparts are white, the back and upper wings are light gray, and the wingtips are black with white spots. The adult's legs and eyes are yellow, and the bill is yellow with a black ring near the tip. During the first winter the back is gray, the head and underparts are speckled with brown, the wings are patterned with brown, white, gray, and black, and the tail has a black band. Second-winter birds somewhat resemble adults but have a narrow black band on the tail. Males and females look the same. The Herring Gull is larger and the adult has a yellow bill with a red spot on the lower mandible, and has pinkish legs. A sub-adult Herring Gull may have a broad dark ring around bill, but will also have a broader black band on the tail. Habitat: Large rivers, lakes, and reservoirs. Also seen in parking lots outside shopping malls and fast food restaurants, and garbage dumps. Diet: Fish, insects, earthworms, rodents, grain, garbage. Nesting and reproduction: Ring-billed Gulls do not nest in Tennessee. Gulls seen in summer are usually non-breeding immature individuals. Status in Tennessee: The Ringed-bill Gull is a common migrant and winter resident across the state arriving in late September and departing by early May. Although not typically thought of as a predator of small, fast-flying birds, a Ring-billed Gull was photographed chasing and catching a Cliff Swallow in flight in California in 2009! How young birds know where to migrate is still a mystery. Researcher have found that 2 day old Ring-billed Gulls already shows a preference for magnetic bearings that would take them in the appropriate direction for their fall migration. Best places to see in Tennessee: Ringed-bill Gulls are widely distributed across the state on major rivers, and large bodies of water from late September to early May. Ryder, J. P. 1992. Ring-billed Gull (Larus delawarensis). The Birds of North America, No. 33 (A. Poole, P. Stettenheim, and F. Gill, eds.). The Academy of Natural Sciences, Philadelphia, PA, and The American Ornithologists' Union, Washington, D.C.